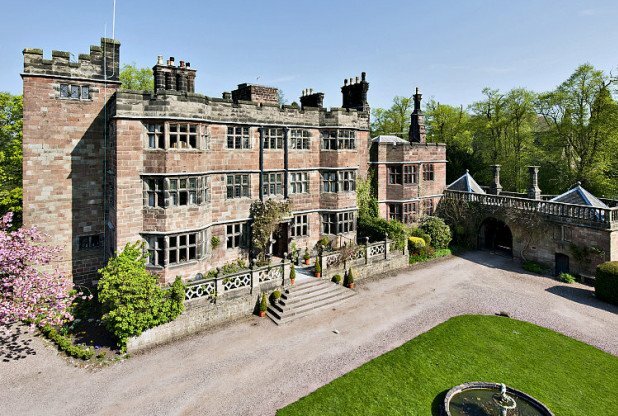 This English Castle was built on the site of an Anglo-Saxon Manor in 1275 by Sir William de Caverswall, who had previously served as the Sheriff of Staffordshire and Shropshire. The Castle remained in the de Caerswall family until 1398 when it passed into the hands of the Montgomeries. In the early 17th century the castle was rebuilt by Matthew Cradock a merchant turned country gentleman. He restored and adapted much of the medieval work. In 1643 during the war between King Charles and his Parliament, the Castle became a stronghold and garrison for the Parliamentary Army. By the early 19th century the castle was serving as a nunnery for a small group of Benedictine nuns. It has since gone through a series of owners, the latest being property developer Robin MacDonald, who bought it eight years ago for £1.7 million and has since spent £1 million renovating it. MacDonald ran into issues with local planning committees for hosting weddings and other events at the castle. He believes that local officials would be more willing to allow the property to be used as a hotel. The main castle is close to 20,000 square feet in size and includes 18 bedrooms, 9 reception rooms, 13 bathrooms and a dungeon. There are also three converted turret cottages — self-contained living quarters with bedrooms and lounges. The entire property is 20 acres in size and includes a pond and garden. MacDonald reinstated the moat in 2007 — it had been drained in 1860 — and it is now fed by natural spring water. The estate agency, Strutt and Parker, explains, “The main part of the castle in all its grandeur remains intact and has been lovingly and carefully restored to an exceptionally high standard by the current vendor who also went to great lengths to reinstate the impressive moat.